During cold weather days, nothing feels cozier than a bowl of hot soup. This version of a New England clam chowder is lighter than the original, swapping out potatoes with cauliflower florets. The clam juice broth makes for a delicately scented seafood base in this flavorful soup. 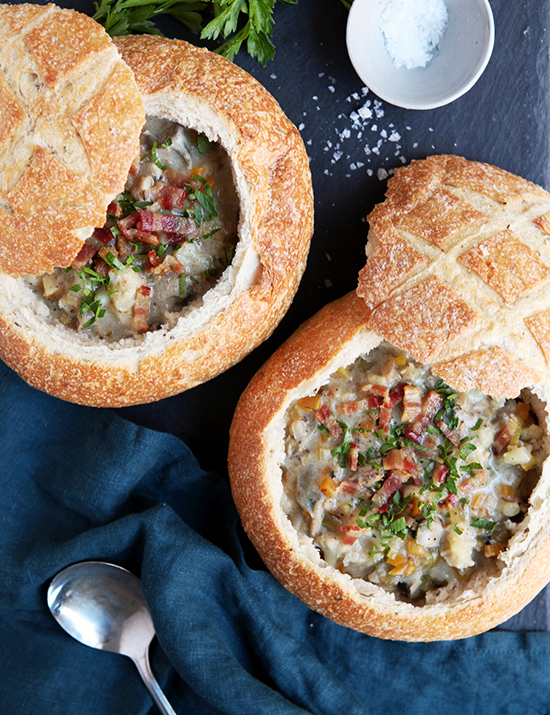 The first time I saw clam chowder served in a bread bowl, I couldn’t believe my eyes. A bowl you can actually eat? Genius! Make your meal fun to devour by serving the soup out of crusty artisanal loaves of La Brea Bakery Rosemary Olive Oil Bread. Subtle and savory, aromatic sprigs of rosemary and extra virgin olive oil give this bread its soft texture and sublime flavor. Trim off the top of each loaf, leaving a border around the insides and ladle your hot soup into each loaf. The caramelized crunchy golden top is one of the hallmarks of artisan bread and perfect for dipping into the creamy seafood broth. Don’t forget to devour the bread bowl after it’s been soaking in all the goodness. Have you seen persimmons at your market this winter and wondered what to do with them? Growing up, my parents had a giant persimmon tree in their garden and we would eat them raw, cooked with cinnamon over oatmeal, and baked in breakfast breads. There are two kinds of common persimmon fruit: heart shaped Hachiya and tomato shaped Fuyu. Hachiya needs to be ripened before eating and Fuyu can be eaten firm or soft. I personally love eating the Fuyu when they are crunchy. I've found that they make an excellent substitution for summer melon in the cold months. In this recipe, persimmon slices are wrapped in prosciutto and served over fresh ricotta on toasts as crostini. Finish them with a drizzle of honey and flaky salt. This appetizer is simple, yet highlights the delicate flavors of the persimmon. Share a platter of these with your pals at your next gathering. There’s nothing like the smell of the house when a beef stew has been simmering for hours. It’s a slow-cooking dish that develops layers of flavor over time. I’ve often used beer in my marinades to tenderize the meat and found that adding sweet maple syrup provides a nice contrast to the bitterness of the ale. When it’s finished braising, the meat should be falling off the bone. Make this dish when it is extra cold outside or when the rain won’t give up. Make a big pot for hungry dinner guests, or keep it for yourself and you’ll have a comforting dish you can reheat and enjoy all week. Find this recipe and many more to cook throughout the year in our book, A Simple Feast.